Dermoid of the ovary. On the coronal scan at left, there is fluid within the dermoid cyst (white arrow). 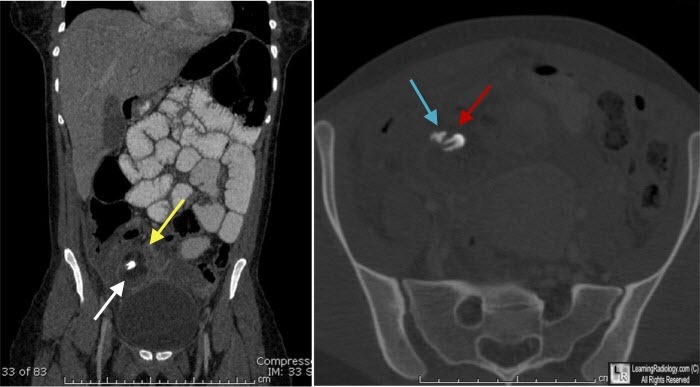 This cyst has actually ruptured and has surrounding infiltration (yellow arrow). On the axial scan, there is a tooth (red arrow) seen at bone windows, as well as a small bone (blue arrow). 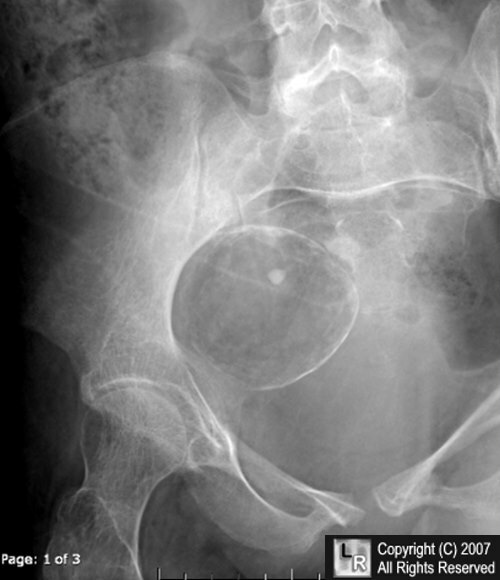 of the abdomen and pelvis shows a cystic mass with a rim-like calcification (red arrows) containing fat density lower than that of the surrounding soft tissue. There is a calcification within the mass (blue arrow) which represents a tooth. This is a diagnostic appearance for a dermoid cyst of the ovary.